So I kinda have a love and hate relationship with mug cakes. I love the idea. Want something yummy, but don’t want to heat up the oven and prepare a whole batch of muffins, but just enough for one person? 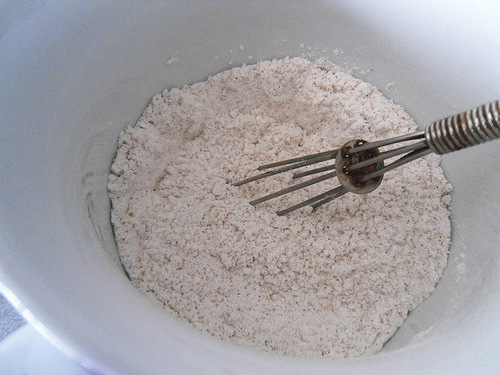 Make a mug Cake. It’s pretty brilliant. 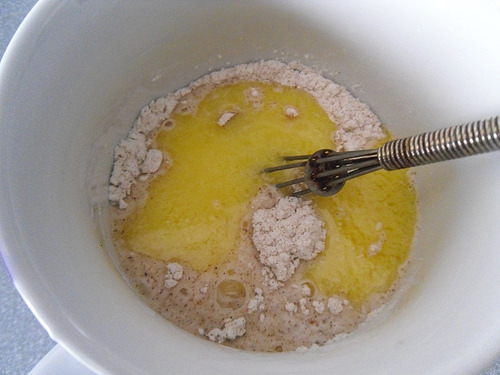 On the other hand my first few mug cake tries were prettty bad, the texture being all off and bleigh. And making one mug cake is about as much effort as making a whole batch, but you have less, so I usually make a whole batch. The problem with a whole batch is that you have to cool it down and store it. So one late evening I had a very bad craving for something sweet and warm, but it was too late to make anything as I would go to bed before it had cooled down. So I decided to give this mug cake recipe a try and I finally found a recipe that I liked. So I decided to share it here on the blog. It’s very quick to make and you end up with the perfect mug cake for one person, perfect for those late night cravings. And you need a big mug. If there is still some room in the mug left after adding anything, you should be okay. This makes a mug cake for one person. 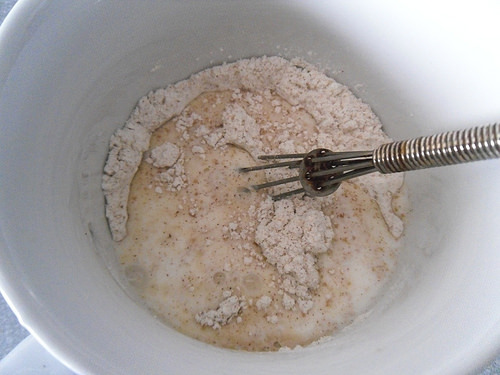 In the mug where you want the mug cake to end up in, combine the flour, sugar, cinnamon and baking powder. Mix well. 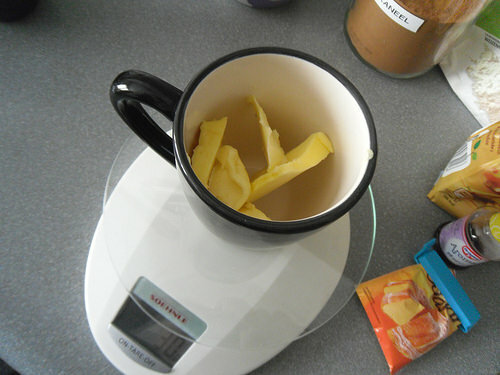 Melt the butter and add it to the mug. 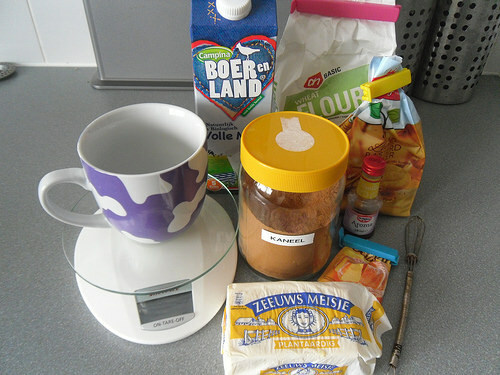 Also add the vanilla essence and the milk and stir well. 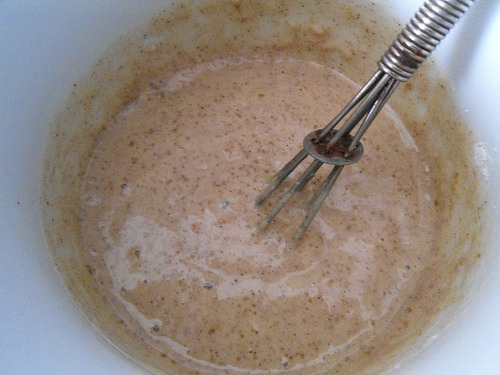 It will be a pretty thick mixture. 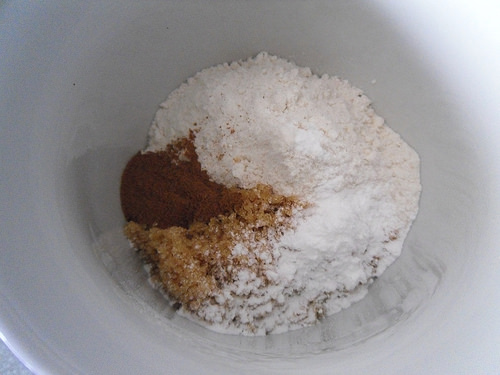 You can add a bit sugar and cinnamon on top for extra flavour. 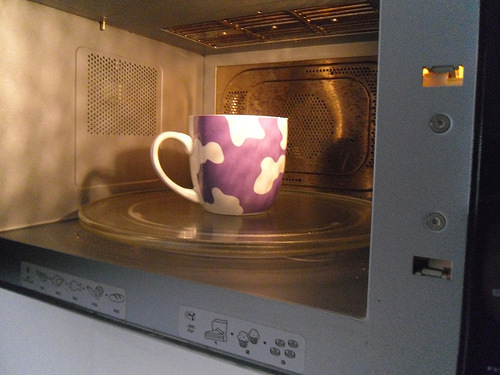 Put the mug in the microwave for 1 till 1 1/2 minutes. Even if it is slightly undone that’s okay as there’s no egg in it. With 1 minute it’s usually oaky, but I often put it in the microwave for a few extra seconds just in case. 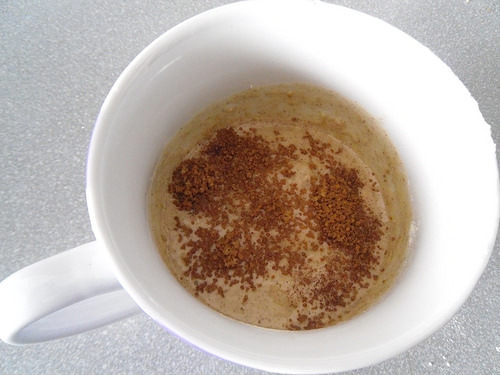 Remove the mug from microwave and enjoy your mug cake, yum! Vanilla Mug Cake. Don’t add the cinnamon and add a bit more vanille essence. Chocolate Chip Mug Cake. Don’t add the cinnamon, but add a few chocolate chips to the dough. 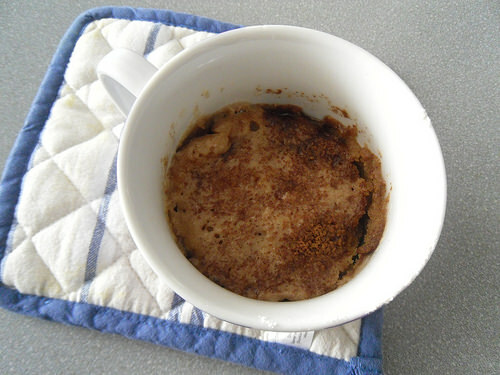 Apple Cinnamon Mug Cake. Add a few pieces of apple to the dough. Have you ever tried Mug Cake? What’s your favourite flavour? Mmm and now I want to make one at 12:30 at night. I don’t know why I always read these food post so late at night. The good thing about mug cake is that you can make it at 12:30 at night ;). LOL love-hate with them…yup. 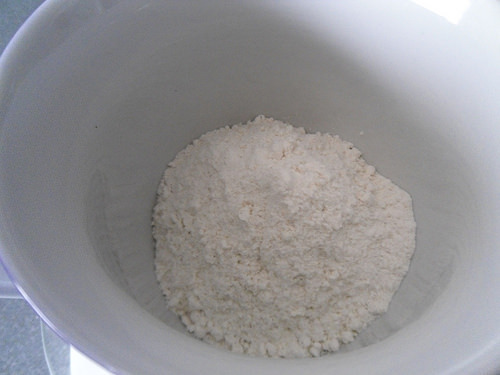 I made one using angel food cake and regular cake mix of your choice. It wasn’t TOO bad. Not nearly as good as regular cake but it worked in a pinch. 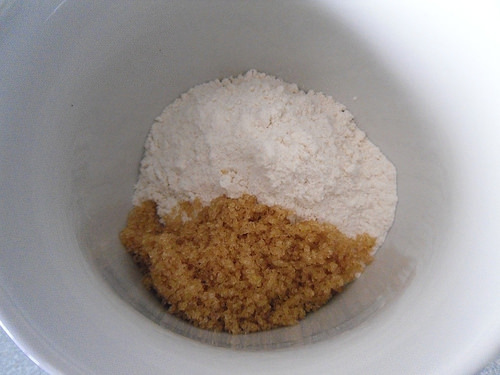 I ended up mixing the dry ingredients together and storing those in an airtight container then when I wanted one I already had it mixed and just needed to add the wet ingredients. Glad ya found one you like! I prefer to make a whole cake, but I foudn this mug cake very handy for those late evening or night cravings when you don’t want to make a whole cake. I like your idea of premixing the dry ingredients! I am sure it will taste great without the cinnamon as well :). I hope you’ll enjoy it! I have… never heard of this but I am SUPER curious to try it out! I heard of them a while ago, but it has taken me some time to find a recipe I liked. They are great if you have a sweet craving and no time or motivation to make a whole cake. I hope you’ll give it a try! That looks like fun to make! I might have to try that out it would be fun to make at night for the kids as a quick dessert. Will have to go out and get some new mugs to use to make this! Thanks for sharing Lola!!! I think it would work great as a quick dessert! I hope you and your kids will like this one! I made sure to pick up the biggest mug we had so I knew for sure it would fit, but a slightly smaller mug would work good too, after making it once you know how the big the mug should be. Thanks for sharing this. Since it’s getting colder here in Ohio, I will definitely be making one. I usually don’t bake when it’s too late as then I can’t store it before I go to sleep, so this is the perfect solution then. I am usually an evening baker :). Let me know how it turns out when you give it a try! I hope you’ll like it! I tried one last year for chocolate cake. It came out dry and I didn’t like it much so I haven’t tried another one. My first mug cake try was also a chocolate cake and it didn’t taste good, I almost gave up on mug cakes then, until I found this recipe. And its a Snickerdoodle one which is one of my favorite cookies. I’ve never done a mug cake so now you have me excited to try it. Thanks, Lola! 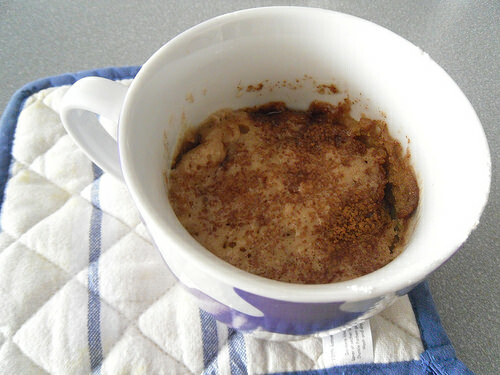 I also love snickerdoodle cookies, which is why I wnated to give this mug cake a try when I found the recipe. I hope you’ll give this one a try! It’s very quick and easy to make and you have a nice one person cake. This looks really yummy. If I wasn’t on a no sugar diet. I would so try this. I wouldn’t be able to do a no sugar diet or any diet for that matter, I love food too much. I hope you’ll give it a try when you can make an exception or after your diet! Yum! I’ve never seen a recipe for a homemade mug cake. I’ve only seen ones made with mixes. This sounds so good! Nicole @ Feed Your Fiction Addiction recently posted…YA Fandom Frenzy Recap & Giveaway!! I haven’t seen many with mixes so far. I did see a mix for one mug cake in our supermarket, but making it from scratch is almost as much effort and I have all of the ingredients always at home anyway. This is a good recipe to start with if you don’t have as much cooking experience. It’s really easy and takes only a short amount of time to make. I have tried a few before this one that didn’t work as well. I made a brownie muffin mug cake that sounded really good, but was really tasteless and gross. This one really tastes like cake and it’s warm and filled with cinnamon flavour. I prefer oven baking too, but for evenings when I don’t have time to bake a whole cake it’s great. I have tried some recipes that didn’t really were to my taste, but this is a good one in my opinion. I am sure if you double the recipe enough you can make a whole cake of it. I agree it’s nice to be able to make just one cake for one person. I hope you can tweak that chocolate mug cake recipe to your liking. Can you let me know which recipe you use? I’ve been looking for a good chocolate mug cake recipe, but haven’t been able to find one so far. This looks good! I’m yet to try a mug cake myself, I keep meaning to, and then I do something like make brownies for 2 instead (I love small batch things!) Think I might have to give this one a go, thank you for sharing! I hope you’ll give it a try! The small batches are fun, especially when you don’t want mroe than one piece of cake or brownie. I tried to make a brownie mug cake muffin once, but it didn’t taste right. I am hoping I can find a good chocolate muffin or brownie muffin mug cake recipe once.